Today, 23rd April, commemorates the 450th anniversary of William Shakespeare’s birth. Up and down the country events and performances will be held to celebrate the life and works of one of the greatest play-writes of all time. We’ve been delving in our archives and have discovered a very fitting tribute of our own! The ‘Age of Kings’ carpet was designed by Francis Millward and woven by Carpet Trades in 1964 to commemorate the 400th anniversary of Shakespeare’s birth. 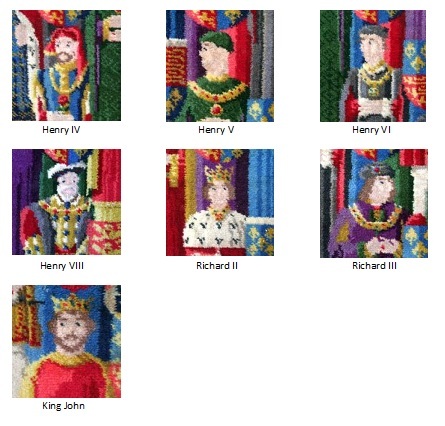 It features the faces of the 7 Kings of England which Shakespeare used as title characters in his plays. Now, 50 years on we think it looks as brilliant as ever and remains a stunning celebration of Shakespeare’s exploration of English history. What do you think Shakespeare would have thought of it? Previous Our Collections Catalogue is Now Online!